At about 8:11 PM on Wednesday, May 16, 2018, officers assigned to the Youth Violence Strike Force conducted a motor vehicle stop as part of an investigation in the area of Blue Hill Avenue and Culbert Street in Mattapan. Upon further investigation, officers observed that the driver of the motor vehicle, Dakym Murray, 24, of Haverhill, was in possession of heroin and cocaine along with 8 live rounds of ammunition. 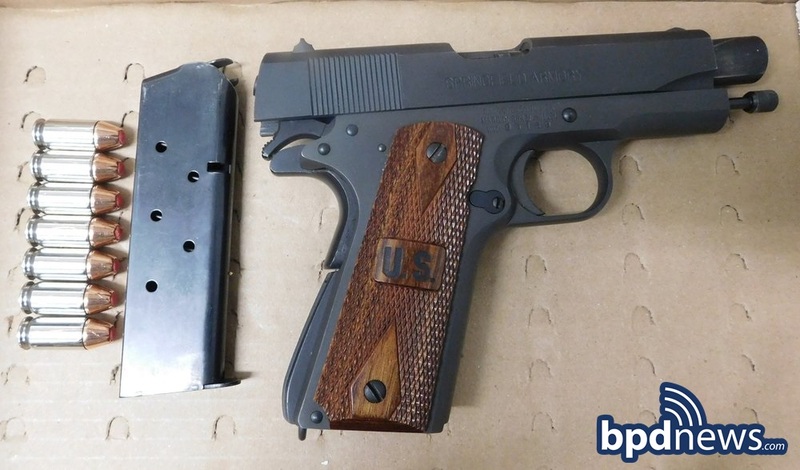 The rear passenger, Jameel Sadler, 24, of Norwood, was found to be in possession of a Springfield Armory .45 Caliber firearm loaded with 7 live rounds of ammunition and in possession of cocaine. Both suspects were placed under arrest without incident and will be arraigned in Dorchester District court. Dakym Murray will be charged with Unlawful Possession of Ammunition, Possession with Intent to Distribute Class A and Class B Drugs. Jameel Sadler was charged with Unlawful Possession of a Firearm, Unlawful Possession of Ammunition, and Possession with Intent to Distribute Class B Drugs.